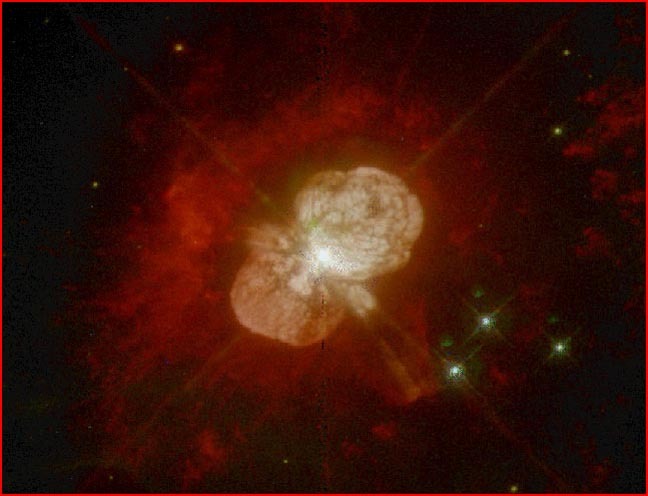 The star Eta Carinae suddenly became the 2nd brightest star in the sky from 1837 to 1856. Then it dimmed to invisibility. In 1940 it began to brighten and has again become visible to the unaided eye. Astronomers expected to see the remains of an exploded star, a small bright core in the center of an expanding shell of gas. But when the Hubble Telescope turned its eye on Eta Carinae, astronomers saw an hour-glass-shaped dust cloud more than a light year wide. (Because it's not a star, the cloud is named Eta Carinae. The star assumed to be at the center is hidden in the cloud.) The two lobes of the cloud are hurtling away from a central disk at more than a million kilometers an hour (600,000 miles per hour). The cloud is the most luminous object in our galaxy. It sheds energy at several million times the rate of our sun, mostly in infrared wavelengths, but also in x-ray. What lies at the center is as unexplained as it is unseen. The traditional sources of a star's energy--gravitational collapse and nuclear fusion--are unable to account for a 3-million-degrees-hot cloud so far from the central star. However, in 1968 Dr. Charles Bruce of the UK Electrical Research Association proposed that planetary nebulas, such as Eta Carinae, are electric discharges. Because the discharge is part of a galactic current feeding power into the stars, the nebula will take on the characteristic bipolar form along the axis of the current with a toroid around the equator. In the case of Eta Carinae, most of the power is intercepted by the surrounding dust. This "electric furnace" effect explains both the high temperatures far from the star and the diminished radiation of the star. The onset of such a cosmic thunderbolt would have been heralded by just such a galaxy-illuminating flash as was seen in the 19th century.